Alfred VanHorn and George (Guy) R.P. Ellison started the business in 1888 opening a drug store on the northwest corner of Park Avenue and 41st Street in New York City. The first listing I can find for VanHorn & Ellison is in the 1889 Copartnership and Corporation Directory with an address of 120 Park Avenue (at the corner of 41st Street). A year or two later, they opened a prescription department and laboratory in the same area at 61 East 41st Street. An item in the 1891 Medical Directory of the City of New York announced the opening. We call special attention of physicians to our complete Analytical and Pharmaceutical Laboratory, which we have established in connection with our new Prescription Department, in separate rooms entirely removed from the general business of the store. Hospital and Surgeons’ Supplies, Felt and Wood Splints, Catgut warranted perfectly Antiseptic. Surgeons’ Silk, Silver Suture Wire, and Silk-worm Gut. Reef and Flat Sponges prepared and sterilized to order for surgical operations. A complete assortment of superior materials for Antiseptic Dressings, made especially for us by Seabury & Johnson. 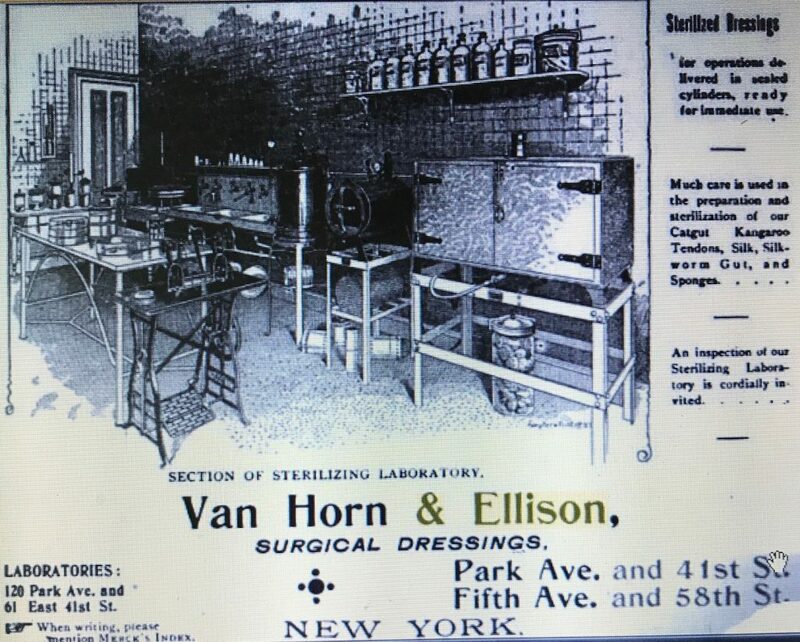 A partial photograph of the sterilizing laboratory was included in a Van Horn & Ellison advertisement printed in Merck’s 1896 Index. 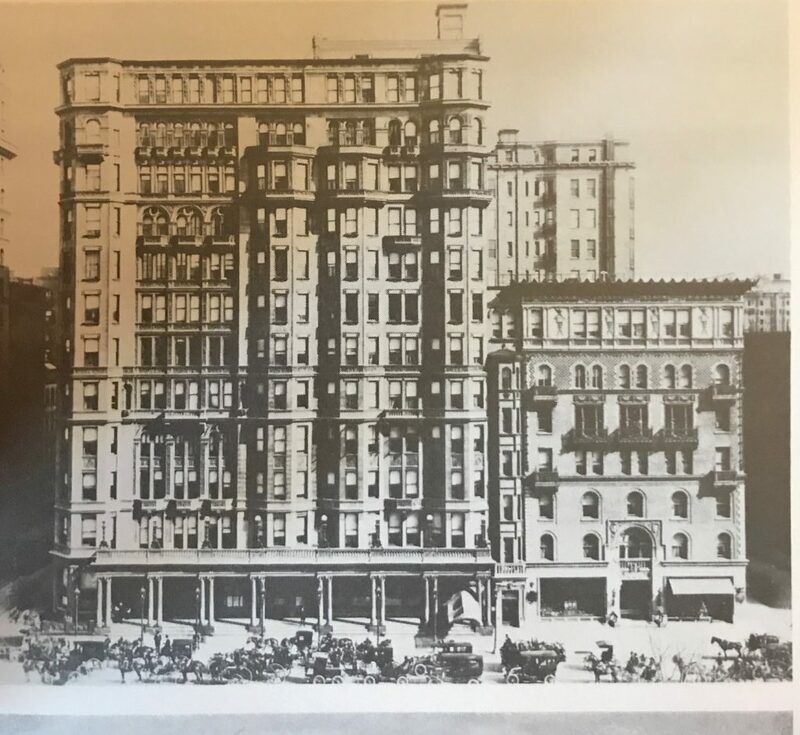 In 1895 the company opened a second location underneath the Bolkenhayn apartment house adjoining the Hotel Savoy at Fifth Avenue and 58th Street. An article in the Pharmaceutical Record announcing the stores opening called it the largest and handsomest retail drug store that New York or any other large city in the United States can boast of and it describes the exterior of the new store this way. Describing the new drug store can best be done by stating that it looks about as little like the ordinary drug store as it is possible to imagine. The immense front facing on Fifth Avenue is taken up by a sheet of plate glass that is claimed to be the largest in the United States. It measures 19 feet x 13 feet 3 inches, and is said to be American plate, the largest that has ever been made here. An old photograph of the Savoy Hotel shows the Bolkenhayn apartment house to the right with the drug store’s plate glass windows clearly visible. Potted palms and plants adorn the window, which is also graced by four elegant specimens of the colored window bottles on the side. Two sprays of electric lights illuminate these at night. Inside the salesrooms the general effect of quiet elegance is obtained by a combination of mahogany and plate glass in side cases and moveable counters. A pleasing contrast is also occasionally furnished by stained glass doors and panels. The ceiling is of a buff, with artistic plaster relief work, while from it depend four elegantly carved metal electroliers of four lights each. The side walls are an olive green with gold plaster relief decoration, while the floor is a pretty mosaic tiling. As if that wasn’t enough, taking up a large portion of one side of the salesroom was a soda fountain whose counter was made up of four different colors of Numidian marble. Behind the wrapping counter was a dumbwaiter and a speaking tube that connected with the dispensing and chemical departments. Orders were either sent down by means of the tube or the prescription was shunted down on the dumbwaiter. According to the article, the store furnished just about anything in the drug line, but only high-end items were exhibited in the salesroom. Only fancy articles for the toilet and boudoir are to be seen in the salesrooms proper. Combs and brushes, toilet waters and cologne, tooth powders, manicure ointments and the dainty appurtenances greet the eye. This advertisement for the Crown Perfumery Co., of London England, provides a good example of the type of articles they showcased. 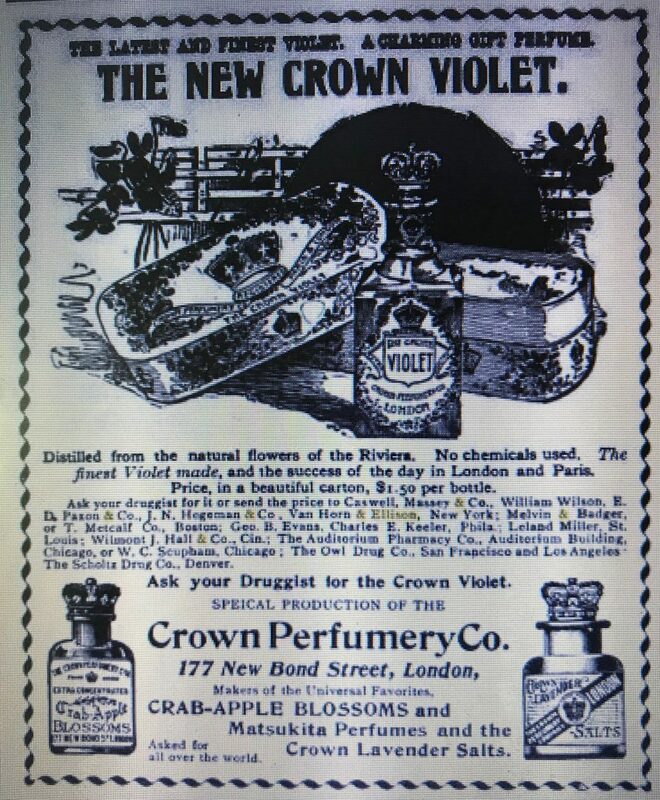 The advertisement was for “The New Crown Violet,” a perfume “distilled from the natural flowers of the Riviera” and referred to as the “finest violet made and the success of the day in London and Paris.” It sold for $1.50 per bottle and Van Horn & Ellison was named in the advertisement as one of its five suppliers in New York. Incorporation papers have been secured by Van Horn & Ellison of New York, to carry on a chemical business; capital $100,000. Directors – G.R.P. Ellison, H.W.Robinson, J.Van L. Young, Alfred Van Horn and S. Harry Ellison of New York City. A year later, in June of 1897, Alfred Van Horn had resigned and internal dissension within the corporation led to charges of forgery against George Ellison based on a technicality. Ellison admitted to having endorsed and collected checks made payable to the firm, but claimed that he had that right. His statement in response to the charges was printed in the New York Sun. After the resignation of Alfred Van Horn as President I controlled the majority of stock. Mr. Van Horn and I had always stood together in the Board of Directors. Since Mr. Van Horn’s resignation I have been compelled to contend against the majority of the directors. There were five directors in the corporation. Besides Mr. Van Horn and myself there were S.H. Ellison, treasurer; Dr. J. Van Loren Young, secretary, and H.W.Robinson, who has no interest, but holds one share of stock to qualify him as a director. These last three directors combined against me because I had called a meeting of the stockholders to amend the by-laws of the company in such a manner that their powers would be curtailed, and because at the annual election to be held in July others would be elected to fill their places. S.H. Ellison, Dr. Young and Robinson refused to give me money due me by the corporation. After consulting my counsel he advised me to take the course I did in regard to the endorsement of checks. Now they have tried to take advantage of a technical point to force me out. It’s not clear how this issue was resolved but less than six months later an item in the January 1898 issue of the Pharmaceutical Record indicated that the business had changed it’s name to Van Horn & Co. The 1900 and 1901 NYC Copartnership and Corporation Directories listed Van Horn & Co. as a New Jersey Corporation located in Manhattan at the 118-120 Park Avenue address. Interestingly none of the original directors, including Van Horn and Ellison were listed with the business. Instead George West and Harry Hutchinson were named President and Secretary respectively and the capital was only listed as $5,000. It’s likely that the incorporation of the company and subsequent absence of Alfred Van Horn and Guy Ellison from company leadership in 1900 and 1901 was somehow related to financial problems that the company was having. 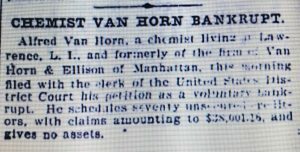 In 1900, the Bureau of Arrears for the Collection of Personal Taxes listed Van Horn & Ellison as a defendant with their ‘disposition pending.” A year later, in September, 1901, both Van Horn and Ellison declared bankruptcy. The Brooklyn Daily Eagle printed their bankruptcy notices on September, 20th and 27th respectively. Then in the 1902 Directory George Ellison and Alfred Van Horn are back, listed as president and secretary respectively of Van Horn & Co., which had moved to 307 Madison Avenue. The treasurer of the company was Edward T. Sawtell. Around this time it appears that the company divided into two separate corporations. In the 1904 NYC Copartnership and Corporation Directory Van Horn & Co. remained listed as a New Jersey corporation with Ellison as president and Van Horn as secretary and a New York corporation, Van Horn & Sawtell appeared for the first time. Alfred Van Horn and Edward Sawtell were listed as president and treasurer respectively of the new company. Guy R.P. Ellison, formerly of the firm of Van Horn & Ellison, New York, is now with Johnson & Johnson as detail representative. Mr. Ellison will spend about a month in the Twin Cities. He is especially posted in the manufacture of ligatures and in the scientific departments of his firm. Van Horn began with Johnson & Johnson in 1919 when they acquired Van Horn & Sawtell. The acquisition was reported in Red Cross notes that year. Johnson & Johnson has taken over the well known firm of Van Horn & Sawtell of New York, and have made it the Van Horn & Sawtell Department of Johnson & Johnson. This consolidation means the continuation of a policy of progress, a gratifying increase of laboratory facilities and the addition of Mr. E.T. Sawtell and Mr. Alfred Van Horn to the personnel of the Johnson & Johnson organization. In the dispensing department only two kinds of bottles were used – white and blue. The blue was only used when the contents were for external use or were poisonous. The bottle dates to the period between 1888 and 1897, when the company name was Van Horn & Ellison.